Half eaten bowl of Lucky Charms before him & my sweet when he wants to be, always entertaining son, JM, starts in this AM. Lobbying his Mama. Working it with all the preschool logic he can muster. The boy wants fruit snacks. In Markese, his somewhat still toddlerfied talk, it comes out "root nacks." We're two days away from his fourth birthday. He & Mama had been shopping just yesterday. They returned with all sorts of goodies for his Toy Story themed party. And not just Toy Story, but Toy Story Three. If you forget to add the third word he'll correct you. "Toy Tory Free." 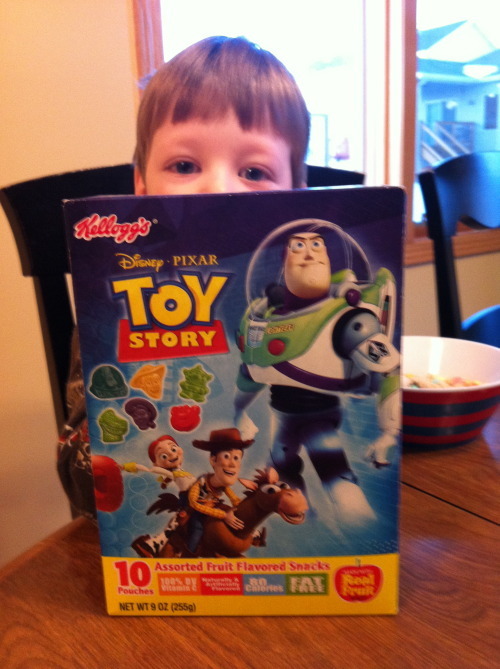 One of those goodies was a box of Toy Story Fruit Snacks. Fruity. Chewy. But, dare I say, waxy. JM wants root nacks right away. I wanna open my root nacks now, Mama. You can't eat them now, John Mark, they're for your birthday. I won't eat them. I'll just hold them. How long do you think ten root snacks will last in the hands of a three year three hundred sixty three day old boy before they make it to his mouth? We think we can get close to our temptation & not fall. Maybe. Some. But not always. No more than a preschooler with root nacks. Why even go there? Share a comment. What does this Scripture teach you about avoiding temptation & falling to it?